This entry was posted in Uncategorized and tagged Anglican, Bible, Disciple, Bible, Christianity, Death, Disciples, Dominican, Episcopalian, Gospel, Gospel of John, Holy Week, Jesus, Lent, Moral Theology, Palm Sunday, Religion, Salvation, Scripture, Spirituality, Theology. Bookmark the permalink. What a contrast in a few days time. How often I too have rejoiced for the wrong reason, celebrated the wrong events. Pray God that I learn to understand better from those mistakes as I continue my journey listening for the whisper of Christ. I will pray for just those things. 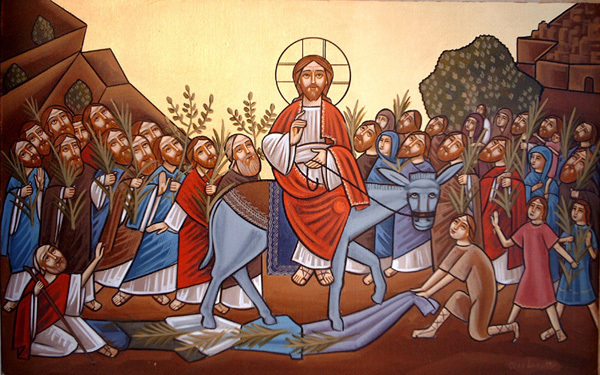 How many have we mistakenly touted as Hosanna, even since? Leaders, politicians, heroes, musicians, actors…all for the wrong reasons. We’re fortunate God loves us more than we deserve! Nice posting, James. Thanks for giving me my first palm Sunday message of the day. I guess we both have had the “two parades” idea floating in our minds (that is my focus for my post tomorrow) … great minds think alike … or maybe the study of contrasts is an important part of this week. Perhaps it’s two minds thinking alike, or perhaps it’s the same Spirit. In either event, thank you.